A brightly lit tree, gifts wrapped with a bow, fresh snow and Mistletoe! Sounds just like the holiday season. The mistletoe itself represents the holiday spirit. The plant symbolizes love and peace. This is where the tradition of kissing under the mistletoe stems from. It is believed that couples who kiss under the mistletoe will have good luck and a long, happy marriage. The act of kissing means to abstain from violence and bringing good greetings of peace. However, mistletoe is not always as jolly as it seems. The plant that looks like nothing more than thin branches with oval leaves is actually a parasite. Mistletoe is used in homes as decoration for the holiday season but this plant is not a giver. Contrary, the evergreen plant uses tree limbs as a host to draw water and nutrients from. These plants get around with a helping wing. 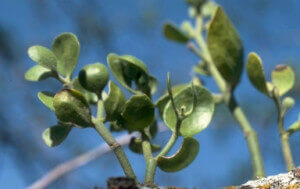 Birds eat mistletoe seeds and eventually redistribute them in which the seed adheres to tree limbs. Heavy infestations can stunt growth or stress your trees. But mistletoe is not always a bad guest. Sometimes it is even the host. Many ecological benefits come from mistletoe, such as animal habitats, food for animals, and helping in pollen distribution. Take a look up at your bare trees this winter, if you happen to see a cluster of evergreen on the limbs than chances are you have mistletoe.